"Marco" walking his route in Manhattan. For most people, checking the mailbox is an anonymous interaction. But your postage worker might actually feel quite connected to you. Because although you may have no idea what he or she looks like, they've probably got a picture of you in their head based on what's going in your mailbox. And as Kate Hinds found out in conversation with her mailman, the picture might be surprisingly accurate. I often work from home. This means I take special interest in my mail delivery, both to procrastinate, or keep a lookout for a paycheck. So sometimes I'm around as my letter carrier - let's call him Marco - stuffs my apartment building's 36 separate mailboxes. Marco is a compact, 40ish Bronx native with tinted glasses and a fondness for silver jewelry. And at first that was pretty much all I knew about him. But one day we struck up a conversation. And it quickly became clear that Marco knew far more about me than I did about him. "Okay, you're a vegetarian," he muses. "I know the church you belong to. I know your children's names." He mines his memory for more examples. "Knowing the church that you belong to, knowing of its liberal mindset as well, I can profile you by saying you're a peace activist probably." He was fairly on the mark, and it made me wonder: Just what does Marco know about the people on his route? And is he paying attention to all of us? "Anybody who gets mail in the name of peace and goodness and the Humane Society, all the things that I subscribe to - immediately I'm going to be attracted to these people - they're like-minded," he says. One day Marco lets me follow him on his route. 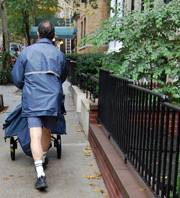 It's a one-block section of a Manhattan street, where he delivers mail to 1900 people. We start off in the lobby of my building, where I ask him how he gleans information about his customers. "There are times when I'll see a customer one day, and I'll think perhaps it's their day off, they called in sick," he says, leaning against my building's front door. "Then I see them the next day, and the day after, and two weeks go by, and you're still seeing the person a lot and you say, 'Boy, I won't be surprised if they got laid off,' and about a week later they get their first unemployment check." And suddenly I'm seeing my block through Marco's eyes. "If someone's mail backs up, and they're not picking up their mail, you begin to think 'Gee, I hope that person's okay,'" he explains. "I've knocked on doors, and I've rung bells. And many times someone says 'Oh yeah, I just got the flu, I haven't got down to the mailbox, but gee, thank you for checking on me.' And I say 'Well, here's your mail, I hope you feel better.'" Marco became a mailman out of necessity - not by choice. Although he took the various civil service exams after graduating high school, he initially wound up working as a technician in a hospital. It was a union position, and in 1984, he went on strike for three months. "I had just gotten married," he recounts. "I was out of work, I got called by the postal service and I said you know what? I need a job. I didn't want to be a mailman when I grew up, though, so there was that sort of struggle that I went through. But I took the job, and that was it. I went through terrific culture shock in the beginning. It took me a long, long time to get used to it." A decade, to be precise. "I just decided, you know what? If you can't get out of it, get into it," Marco says. "It was almost like an epiphany. I woke up the next morning and said 'Now I'm going to be the greatest mailman in the whole world.' I didn't call in sick for 10 years. I just applied myself, fell in love with my job, customers - fell in love with everything in the process." But like all relationships, it can get a little routine. "Every couple of years I would allow myself to be transferred to a different street. And the challenge was to learn another 3000 names, and faces," he says. "And so that was fun, until you get tired of it. And you did it over and over again. And you got to meet lots of different people." Different people who, after 20 years of pushing a mail cart in the same two-block radius, Marco's come to think of as his neighbors. "I spend more time on this street than I do on the street that I live on," he says, pointing his mail cart down the block. "This is as much my neighborhood as it is yours." Just recently Marco told me he was dating one of my neighbors. How did it start? A conversation over a piece of mail. I just became a new mailperson and this story is awesome. I know it will be interesting and fun.. thanks for the insight. i have been a mailman for 34 years and too know much about customers, maybe too much sometimes, but when i leave for the day i keep all that info, which is in my head, at work. Just from the nature of job in handling peoples corespondents you learn things. What a neat story. My dad is a retired letter carrier from Kansas City and he carried mail in the days when more women were home during the day. My dad knew all of the residents on his route to the point where he got presents on his birthday and a ton of stuff for Christmas like, popcorn tins, chocolates and warms socks. One of his customers had a purebred airedale terrier who adored and when her dog had puppies, my sisters and brother and I were allowed to pick a puppy of our own and our Peppermint was a huge part of our family's growing up years. I have seen my postman occasionally and have talked with him a bit if I happened to be home. I can't but help think that we have lost something, that it was a gentler era. My dad's residents loved him and he loved them. He looked out after them in a million ways that wasn't part of job description. My dad turned 90-years-old this year and he still remembers his 35-year career as a mailman with fondness. I am a Postal Carrier and thought that the story you did for The Weekend Shift is so very true. I am very glad to hear that someone or somebody at Public Radio did a story about the Mailmen and Mailwomen. I don't hear many stories about mail carriers on the media even though we are pretty much everywhere. I found this story kind of funny also, because I was listening to your show while I was carrying my route. I have a had a very fortunate "postal career", I live 5 minutes from the post office I work at and I am my own Mailman. I have gotten to know the people in my neighborhood very well as their mailman. I find it to be a position of great trust, honor, and respect to be where I am at and what I do for my customers/neighbors. It also gets to be a little awkward too, especially when neighbors invite me to a party or gathering. It is because I know so much about them from delivering their mail that I generally have to really watch what I say, so as to not start gossip or rumors. Just wanted to say finally someone knows we are out there delivering the mail in everything nature and the job itself throws at us and THANKS! !